Very few artists will I call undisputed geniuses. Musicians whose contributions to the world at large so greatly influence what we heard after their prominence and what we hear today. Miles Davis is an undisputed genius. Much like Dylan in his body of work, Davis is perhaps the most celebrated artist in jazz and also one of the most reviled. Aren't all geniuses? Whereas contemporaries like Sun Ra, Coltrane and Ornette were about the future, pushing the boundaries of jazz to the outer most extremities, what makes Miles truly unique is that though he is always on the cutting edge of whatever jazz movement is about to happen, he is alway a product of the now. Each album he cuts is a look into the sound that is happening and usually executed better than anyone else could even imagine. Shh. Listen. Calm, Peaceful, Elegant, Graceful. 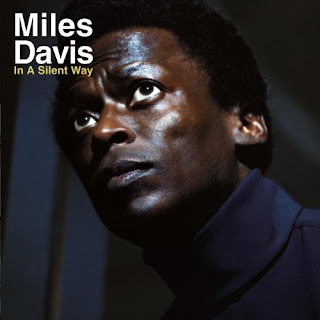 Those are the perfect words to describe the amazing music Miles' packs into just 38 minutes on In a Silent Way, his second greatest album and most accessible gateway to his fusion genius. The music that graces IASW is perfect, an amazing fact considering the way it's structured. The first side, a single 18+ minute track entitle 'Shh/Peaceful,' consists of vamps and solos. No melody is ever present. All that is played is an unbeatable groove in which Miles and his sidemen-who I'll get to in a minute-solo delicately over. The same is true for side two, but only half of it. Once again, one side yields one track, except this track is actually a three piece medley with one piece acting as bookends. 'In a Silent Way' opens, 'It's About that Time' follows, and 'In a Silent Way' closes. The title track is so simple, yet so beautiful. Just each musician taking turns playing the melody line, with each one joining at the end. Simple, but oh so lovely. 'It's About that Time' is essentially the same set-up as 'Shh/Peaceful,' featuring more great soloing and what may be the most infectious groove known to man. The whole album is so simple on the surface, but so amazingly complex below it any fan of any music can appreciate it. The musicians Miles works with are incredible, as is the format they inhabite. The band is Miles on trumpet, John McLaughlin on guitar, Wayne Shorter with his debut on Soprano Sax, Herbie Hancock & Chick Corea on electric piano, Joe Zawinul on organ, Dave Holland on bass, and Tony Williams on drums. You read that correct. In a Silent Way features THREE piano players. The sound of that makes all the music I wrote about sound idiotic, but trust me, it's not! What seems to be muddled, messy music is actually organized, pronounced, and defined. The three keys work effortlessly around eachother, with Hancock and Corea brilliantly trading off runs while Zawinul juts in and out. They really create the back drop over the rock steady rythm of Williams and Holland that makes the music so awesome. The soloing is stunning. Miles never sounded better. His phrasing is lyrical as ever, his tone beautiful, and his dynamics are incredible. McLaughlin is just as good. In his first recording EVER, he follows both the path of Zawinul and is his own soloist. He juts in and out, and finally gets his own opportunity to solo away, experiencing a serenity never heard on his Mahavishnu Orchestra recordings. Wayne Shorter is every bit as good. Though his main ax is tenor, he is still quite good on Soprano, and his lines are lyrical, precise, and oh so soothing. The delicate soloing on In a Silent Way only further accent it's calm nature. It really is amazing. How such an unorthodox line-up and such a sketchy plan can produce such beautiful music is simply a testament to Miles Davis the visionary. Every second of this music screams genius at the top of it's lungs, and every precious note played displays perfection. This album is silent. And silence is the sound of brilliance.